According to our definition, good visitor management goes far beyond the mere reception process. Especially the logistics sector is a particularly good example as a vertical market. In addition to the reception process, topics such as parking management, truck intake control, the loading and unloading process or the subject of instruction and training play an important role. Added to this are the language barriers associated with a high proportion of international suppliers. JAMES provides functional solutions for these and other processes as visitor management. The transport sector is characterized by multilingualism and the 24-hour cycle.  In order to allow this process to be carried out by the operator without major human resources, we offer the possibility of a self-check switch (kiosk-system) for suppliers.  This consists of a pillar with a multitouch display, a QR code reader and connection to the access control. 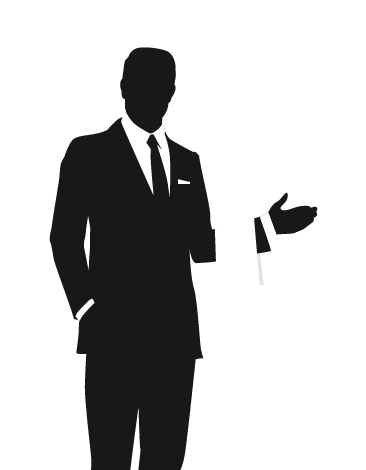 This allows the vendor to navigate independently through the check-in process. Training and instruction are also available via the terminal. Thus, necessary teachings such as house and area regulations or safety briefings can be carried out simply and quickly and even linked to the access control. 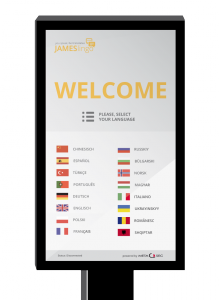 In order to take account of the many countries of origin of the suppliers, JAMES speaks various languages. 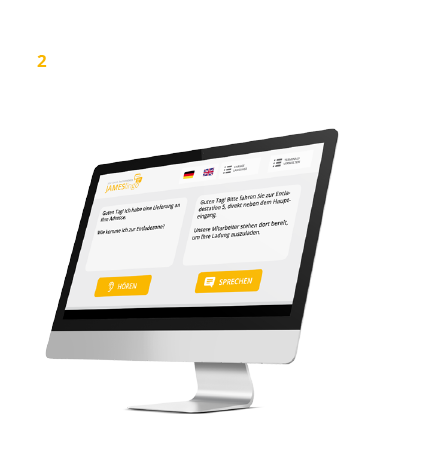 With the extension JAMESlingo even a simultaneous translation (both in text form and spoken) is possible. The use of QR codes facilitates a number of processes. For example, The country language of the supplier, date details or the freight. These data are read out on arrival and can in turn trigger or simplify processes. Integrated intercom for communicating with the doorman or reception. 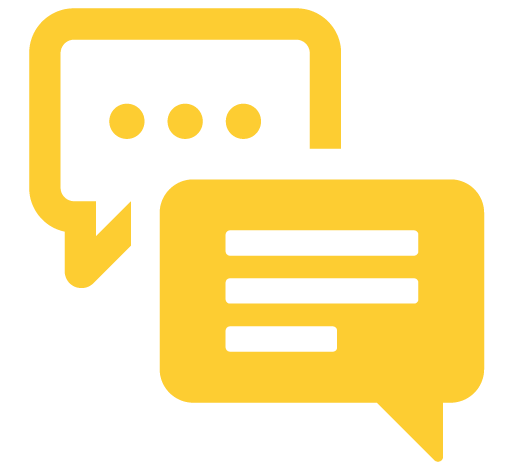 With the extension JAMESlingo it is even possible to have simultaneous translation. n order to take account of the different countries of origin of the suppliers, we have developed the language software JAMESlingo. JAMESlingo translates spoken or written texts in real-time, thus ensuring a perfect understanding between the doorman, the receptionist and the supplier. 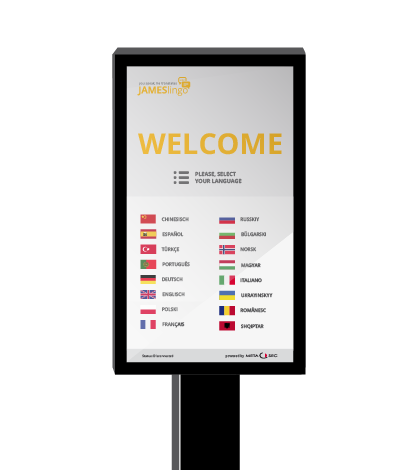 Welcome screens in the respective country language of the suppliers are automatically loaded as soon as a QR code or corresponding ID / driver license has been scanned. The steele is configured and populated according to customer requirements and can be produced in different dimensions and colors. 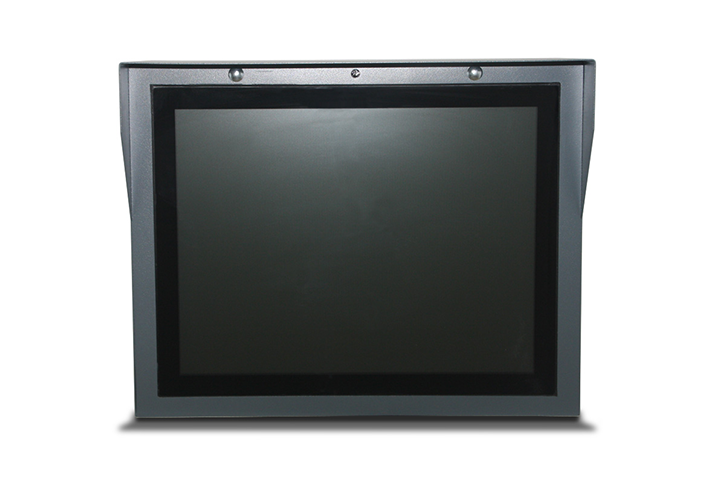 The terminal is configured and populated according to customer requirements and can be produced in different dimensions and colors.